3 monsters with the same Attribute but different Types If this face-up card is destroyed by battle, or leaves the field because of an opponent’s card effect while its owner controls it: You can target 1 card in your GY; add it to your hand. You can only use each of the following effects of “Curious, the Lightsworn Dominion” once per turn. ● If this card is Link Summoned: You can send 1 card from your Deck to the GY. ● If a card(s) is sent from your Deck to the GY by an effect: Send the top 3 cards of your Deck to the GY. Curious, the Lightsworn Dominion is the Lightsworn Link monster that is splashable in other decks. Three monsters are needed, but they have to have the same Attribute but different Types. Lightsworns can do this easily depending on how many of each Lightsworn monster you run, but also can be found in the 60-card mix mash decks that have been seeing play. SPYRALS could Link Summon this card, though they likely wouldn’t, they have synergy with their own Link Monster. Curious is a 1-for-1 when it is destroyed by your opponent, but you also get a free Foolish Burial on Curious Link Summon. Its best effect is its Lightsworn effect of milling 3 off the top once per turn if a card(s) is sent from your deck to the grave. Foolish Burial, Charge, Recharge, Armageddon Knight, Glow-Up Bulb, and its own effect off its Link Summon will activate this effect. This is another way for Lightsworns to get more mill power, but they already have 3 Recharge and 3 Charge. If you get this card out you should likely get a Judgment Dragon out that turn unless you make this over more than one turn. As for 60-card decks, this helps them as much as Lightsworn, but they don’t need to run a lot of Lightsworn monsters to benefit from its effects. We end this week off with another great Link Monster in Extreme Force in Curious, the Lightsworn Dominion. If this card is Link Summoned, you can send a card from the deck to the GY. When a card is sent from your deck to the GY by an effect, you can mill 3 cards. Obvious Lightsworn synergy is obvious. You can send anything to the GY with this, and Lavalval Chain has proven that being able to send anything from the deck to the GY is good. Also the first effect can trigger the second one to get some mills in, and you are likely playing this in a deck that wants to mill. Curious is a great Link Monster. Sure you got to go out of your way to get three monsters with the same attribute but different types, but that is not too hard in this game, it is very possible actually. Curious is a great Link Monster, play it in the proper decks. 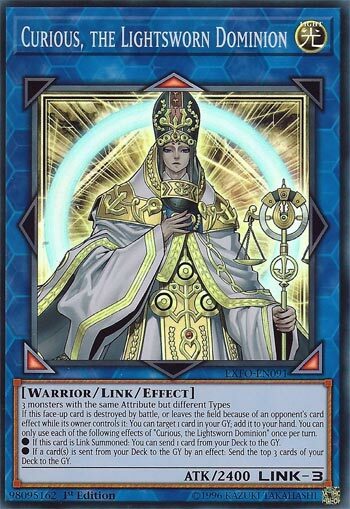 Curious, the Lightsworn Dominion, is another Link Monster, to close our week. Link 3, 2400 attack, Light and Warrior, although she does have a bit of an odd Link requirement. Three Monsters of the same attribute, but of different types. This is fun, because in addition to being usable in Lightsworn, she can be Teched other places as well. The first effect is the more splashable of the two. When Link Summoned, you get to dump a card from your Deck to the Graveyard. Obviously milling helps Lightsworn about any time ever, but it speeds along combos and many other Decks as well. Secondly, if a card is sent from your Deck to the Graveyard by effect (any effect) send your top 3 cards from the Deck to your Graveyard. Pretty much the same to be said there as with the first effect, although dumping 3 as opposed to 1 probably benefits Lightsworn more than anyone else. It’s funny, Lightsworn will definitely enjoy this card, but Lightsworn doesn’t NEED it to survive either. They have a full arsenal as it is. That doesn’t take away from this card though.